Though I enjoy both writing and watches, it has been some time since I have written a review. The last sort of piece I expected to break that streak is an homage watch. I have handled great modern and vintage pieces from Omega to Rolex, Aquadive to Doxa, and many points elsewhere on the spectrum. But I do find myself with a soft spot for divers that manage to integrate true style and utility into an affordable package. 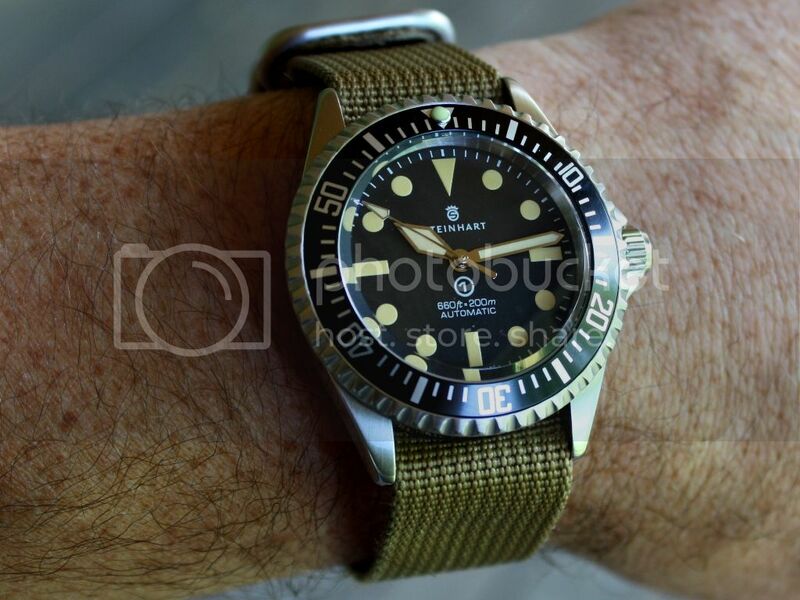 So when I took a Steinhart Ocean 1 Vintage Military as a small component of trade on a higher end diver, I did so on a lark. I expected to find myself lukewarm and was already set to either give it as a gift to a family member, or let it back out into the market same day. I have typically found myself on the fence with homage pieces, though I have definitely seen MKII and Precista watches that have caught my eye. I do appreciate taking successful design and style components from great classic watches, and integrating them into pieces that are approachable by a broader audience of enthusiasts. Where homage watches lose me somewhat is when they attempt to be dead on ringers of the watches to which they pay tribute. With this backdrop, I found myself unusually taken by this Steinhart OVM almost immediately upon arrival. 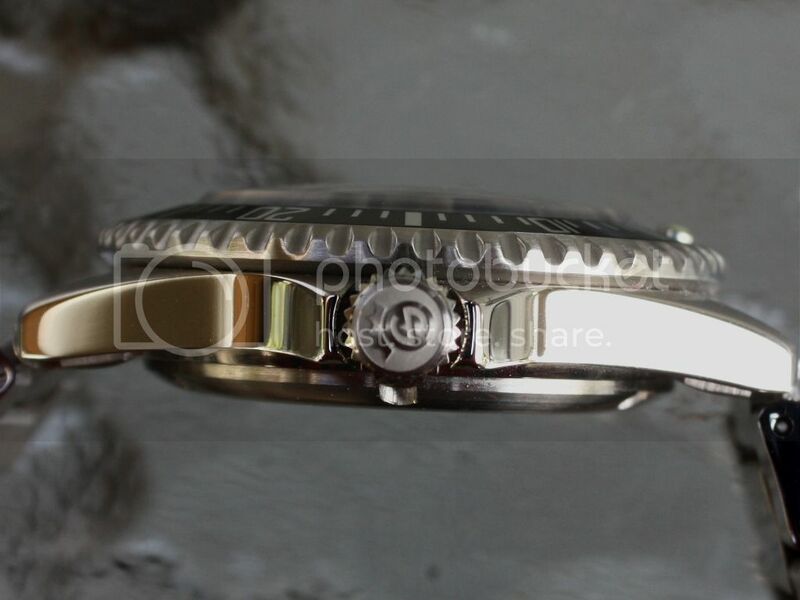 The watch sports a 42mm case, with 22mm lug spacing. It comes on a very substantial bracelet that tapers down to 20mm at the clasp. I liked this choice right away. The watch to which this piece pays homage is the legendary Rolex 5517 Submariner. It was a design released in the 1970's for the Royal Navy. Only about 1200 were ever made, and perhaps a few hundred still exist. It was housed in a smaller 39mm case. That the watch approaches $100K when you can find one is clearly an unscalable wall for most enthusiasts. Still, I was pleased that Steinhart did not go the direct copy route, but rather chose to incorporate critical design elements into a modern wrist watch, including a larger case. The crystal on the watch is another point of departure between homage and original. While the 5517 would have had a domed acrylic crystal, the SOVM sports one of slightly domed sapphire with a beveled edge. Though I can see where many would have rather had this watch fitted with acrylic, I appreciate the decision to go with the beveled sapphire. It is a reminder that the watch is its own thing. I do have a soft spot for acrylic on vintage watches. But I find myself grateful for points of departure from the original. It is a sign of respect in my opinion. Sort of a tip of the cap to the watches undeniable inspiration, without insisting it be a dead on copy. On a practical note, there is an anti reflective coating on the underside of the crystal. Again, this is appealing to me. While I appreciate AR coatings, I usually prefer them on the underside. I am not a fan of the fine scratches to outer AR that always seem to come up with wear. While discussing the crystal, it is a good time to jump to the bezel. I have read of others really appreciating the finish and design of the bezel, and I can see why. It is a solid 120 click bezel with little to no play. The machining of the scalloped edge is well executed. The insert is crisp and is a clear design nod to the 5517. The applied lume pip is very well done, perfectly centered and an attractive touch. Both crystal and bezel are clear winners to me. The dial and hand set are certainly where the bulk of controversy are likely to lie. I have never been one for artificially aging dials or hands. And I can most certainly understand where the soft yellow-brown lume color used on this piece will turn some people off. However, I find myself appreciating it on this watch for two reasons. The first is the near unnatainable nature of the original. If you were trying to copy a watch that was readily available but perhaps a little expensive, that would be one issue. But in a nod to one of the hardest to grab and most expensive divers around, I am a little more at ease accepting the choice. Furthermore, I like the color of the hands and markers. I know this watch is not vintage. The lume could have been white. It could have been the color it is. It could have been orange, or grey or a host of other choices. I am completely comfortable with the choice made, and am drawn to the muted tone. As for lume function, it is unhindered by the tint. Lume is above average, and I can see the time easily in darkness periodically throughout the night on a single charge up before bed. It is not the glow torch of certain Seikos and some others, but it is stronger than average and perfectly acceptable for my use. The markers follow the oversized spirit of the original 5517 "maxi dial" and are quite visible and functional. The mod hand set is well done, with crisp edges and nice polish. The last Steinhart I had handled was several years ago, and I was less than impressed with both bracelet and end links. The hinge was stamped steel, the end links were folded and overall, the bracelet had a less than substantial feel to it. I am pleasantly surprised with the overall quality of the bracelet used for the SOVM. The hinge is forged steel, rather than stamped. The clasp is functional, if not noteworthy, featuring four micro adjusts and a safety. Link removal is easy, with screw pins. I do prefer screw pins that screw from both sides, rather than screwing directly into the link as these do. Though it has never happened to me, I worry that a misthread upon sizing would ruin the link rather than simply ruining the pin. But this is a minor point of preference. It is actually much easier to size this way, as you need only manage a screwdriver on one side of the link for sizing. Of particular interest to me is the design of the end pieces. 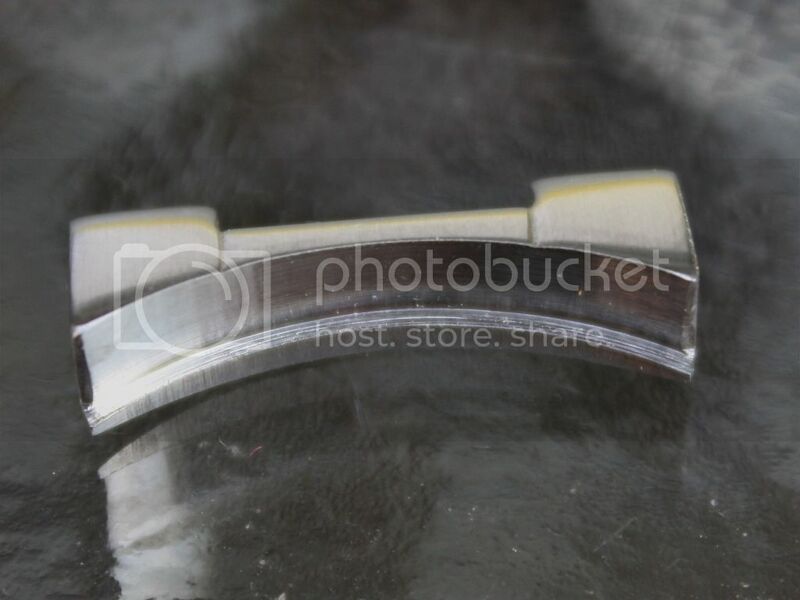 Where most solid end pieces simply have tab extensions on either side to hold itself in place along the watch case, the end links of the SOVM are machined with a lip along the entire curvature. This makes for a very nice and secure fit. I imagine that, over time, it will hold true to the case better than most designs. It is a little thing, but a detail I appreciate. The full curvature lip along the end links makes for secure bracelet wear. Aside from design elements, I want to address the nuts and bolts of the piece, so to speak. The watch runs on the ubiquitous ETA 2824-2 automatic movement. Nothing unique here...just a workhorse movement that is easily serviceable and very reliable. My SOVM is running at about +5 secs/ day. I imagine it may settle back a tick with wear, or I could have it more tightly regulated. But frankly, this is well within acceptable accuracy for me. The signed crown is a screw down, and does its thing smoothly and without wobble. The watch is rated to a respectable 300m depth resistance. This brings up a point worth mentioning. While the Steinhart site and the case back of this watch note 300m, the dial itself notes 200m. The dial marking is an effort to keep with the homage nature of the piece. However, I think that is unnecessary. The piece has substantial variances from the 5517 design, as already noted. 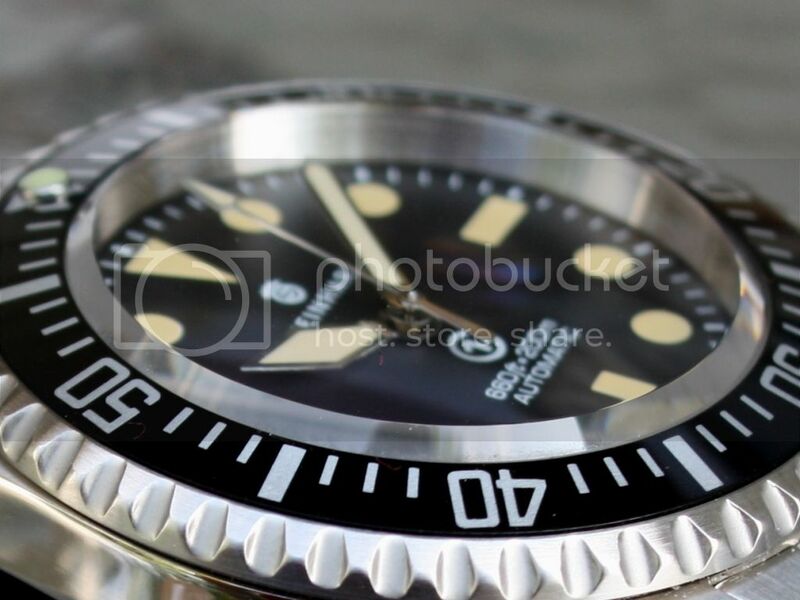 Not sure why Steinhart felt this to be an element they needed to emulate. But this decision is a minor negative to me...not enough of one to interfere with my enjoyment of the watch. For fans of dive watches, case back art is a big part of the aesthetic appeal. I have indeed found myself disappointed in pieces that were otherwise perfectly serviceable divers, but had light engraving and nondescript markings on the case back. 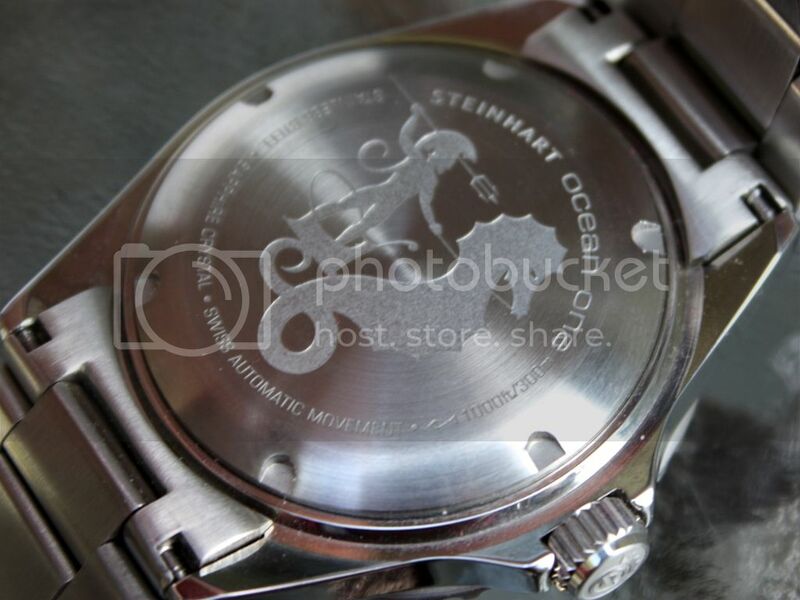 With this personal preference, I am glad Steinhart took the thought to apply their original design to the case back. 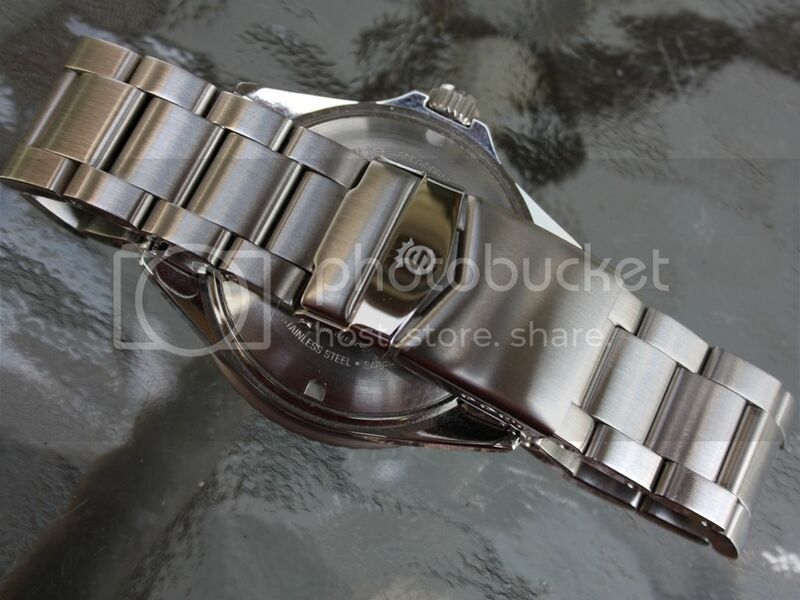 This design is one used on other watches in the Ocean 1 line. Score one for not trying to be a dead ringer to the 5517. In summary, I have to say that I am impressed with the full package put together for this sub $500 diver. It features a nice domed and beveled sapphire crystal, solid 300m depth resistance, swiss made movement and finish, top notch bracelet, crisp and well executed bezel, well proportioned case and lug width and an attractive and practical dial. 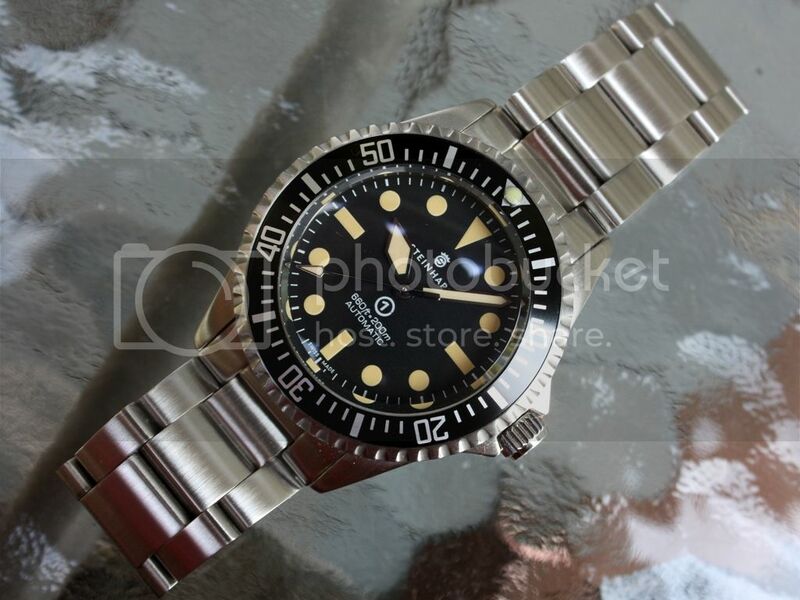 Were I to have never seen a 5517, I would still think the SOVM was a terrific diver for the money. That it efforts to nod respect to one of the great dive watches without yielding to the temptation of being a copycat piece sits unexpectedly well with me. It is well packaged in a nice leather case, another perk for a watch at this price point. For those who know me, the word keeper simply doesn't exist in my vocabulary. However if it did, this watch could be one for some time to come. Thanks to all for reading my ramblings. I do not often post reviews, and have never taken the time to post a negative one. This watch was the right combo of design and affordability to inspire me to share my thoughts. Our hobby is such a subjective one. We all have preferences and find appeal in different aspects. Hopefully, the little things that tweaked me into writing down my thoughts will prove of some value to others considering this watch. SOVM on a zulu, strapped to my 8" wrist. Last edited by Cubbiepants; June 17th, 2012 at 13:35. TGE, Tragic, makai8o8 and 42 others like this. Great review, thanks for sharing. 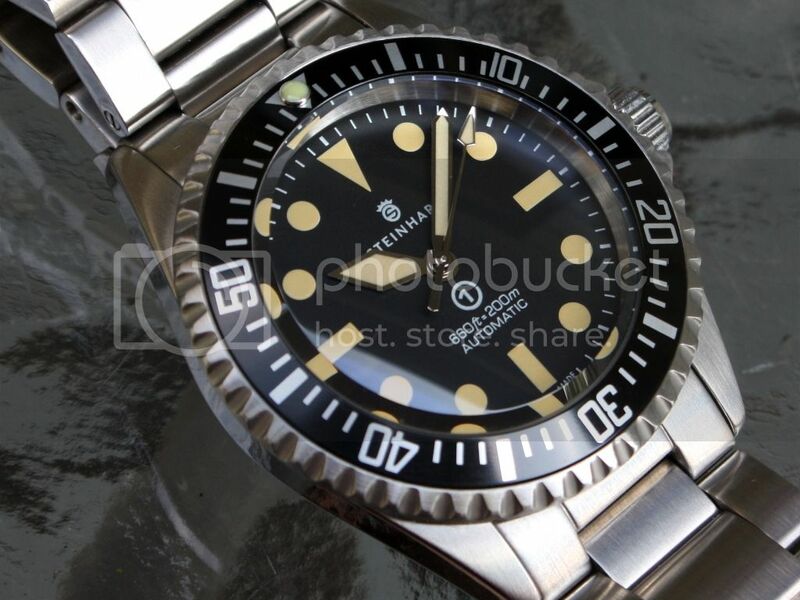 I too really think Steinhart's offer an exceptional watch for the dollar. I had an OC1 Black and loved it save for the Mercedes hands. This is the one I would replace it with. Thanks for the writeup, and I appreciate your thoughts on the homage-factor. I find myself a little on the fence about some homages now, more so than say a year ago when I bought a Debaufre Ocean1 (which I do still have, wear, and enjoy I'll add). 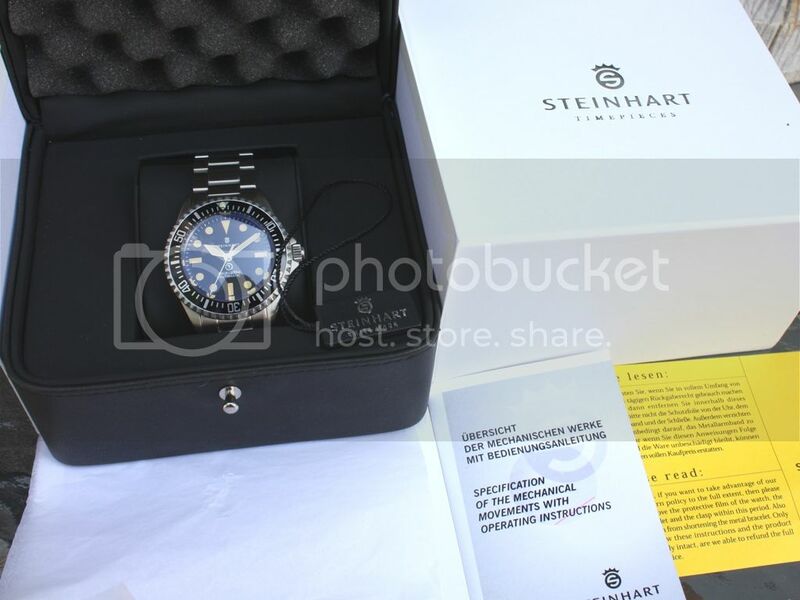 I agree with your points though, and of the Steinhart Ocean models this is by far my favorite now, both for your reasoning on homage-ness and the looks of the piece. I would like to get one of these myself at some point I think. Excellent review, great pics and a pretty slick watch. Great review. As it happens, my OVM is on my wrist as I type this. I find myself grabbing it more and more frequently; definitely a keeper. Thanks for the kind words...Gotta say it is fun to put a little back out there, after all the reviews I have digested through this site. I've seen you flipping LOTS of watches and I know you know your stuff. A review from a guy like you is worth reading. Now wait at least a couple weeks before you sell it cuz that's just poor form....lol. Hah...so true. I actually thought about selling the watch before listing the review, so as not to be accused of inflating the value. Just couldn't let it go quite yet. Last edited by Cubbiepants; June 17th, 2012 at 13:38.